Your children’s eyes are very precious. They should have their eyes examined by an eye care practitioner by 3 years old (before; if anything suspicious is suspected) and before they begin 1st grade. This is to be sure that their vision development is proceeding normally for good clear healthy vision. We measure both eyes to be sure they are working together (aiming and focusing) for comfortable and efficient vision (e.g. lazy eye, etc.). Eye muscle control and coordination will be evaluated along with color vision. Learning in school takes two healthy eyes working together. Children who have difficulty in school, especially in reading comprehension (not reading at their expected level), may avoid reading and prefer non-reading subjects such as math or art. Children’s vision is a product of heredity. If mom or dad are nearsighted, there’s a high probability their children will be nearsighted. 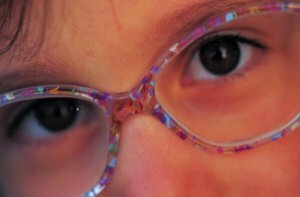 A complete children’s eye examination can give us an indication of what is a normal prescription at their age and whether or not any glasses are necessary. Most times glasses are not necessary but at least we know how development of their vision is progressing so we can monitor their eyes so no problems will interfere with their school or learning process.